Why Should You Stage? It’s All About Time, Money and Getting on with Your Life. Average home buyers judge your house within 8 seconds of coming through the front door. If your house doesn’t instantly connect with them, they are out the door within minutes and moving on to the next property. Once they are gone, you have lost them forever. Your house needs a competitive edge to make buyers immediately fall in love. To gain that edge you must stand out above all the other houses they see and be priced right. The best, proven way for your house to shine is to Stage it! Most homeowners are too emotionally attached to the HOME they have created and can’t see their property as a HOUSE. They have invested their heart and soul into creating their “nest” and confuse decorating with staging. This is where we can help. We provide the expertise needed to create an environment that pulls buyers in and establishes an emotional connection. Staging highlights ALL properties, regardless of their pricing! But what’s the proof that your Staging investment will really pay off? 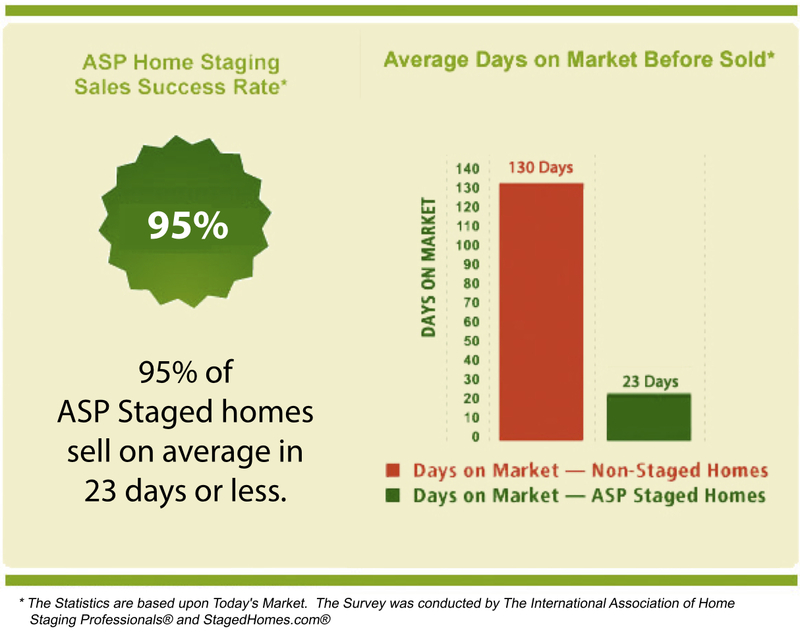 StagedHomes.com research findings indicate that 95% of ASP® Staged homes sell within 23 days or less as compared to the national average of 130 days. By selling faster, you’ll have fewer mortgage/utility payments and maintenance costs. You’ll save more money and can move on with your life! 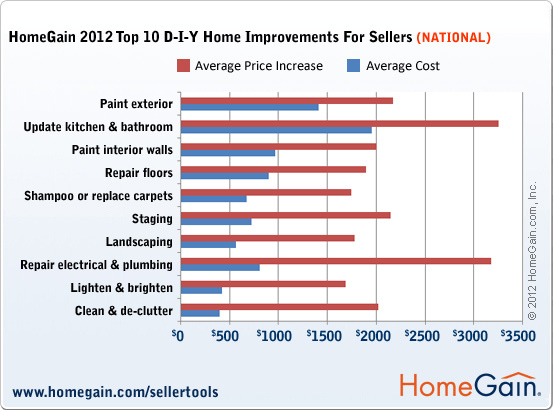 HomeGain® surveyed nearly 500 real estate agents nationwide to determine the top 10 low-cost, do-it-yourself home improvements for people getting their home ready to sell. 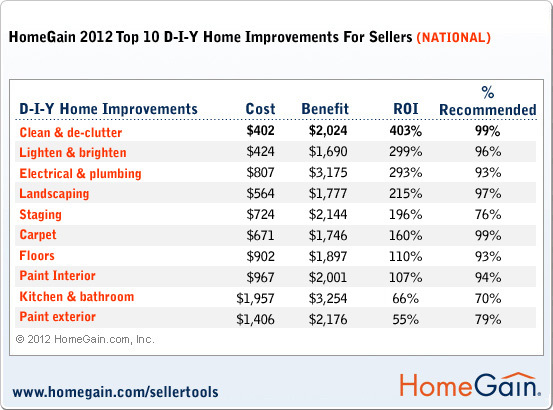 These are based on average cost and Return On Investment (ROI) to sellers. For every $724 invested in Staging, sellers gained an additional $2,144…a 196% Return On Investment! Also notice that many of the highest ranking items are actually part of the Staging process, such as “Clean & de-clutter” (403% ROI) and “Lighten & brighten” (299% ROI). Staging will also make your house look it’s best on the Internet. Why is this important? Since 90% of buyers search for houses on-line (National Association of REALTORS® Profile of Home Buyers and Sellers) and 45% of them do not read the comments, but rely strictly on the photos to convince them to see a property (Wall Street Journal), it is critical for your house to look sensational on-line. We will make your Internet house photos look warm and welcoming from the curb and throughout the house. We will stage your home so that your photos entice buyers to “come in” and browse each room. appealing and are recognized as the best properties to see. 7. Buyers view Staged Homes as well cared for properties. 8. Building Inspectors view Staged homes as cared for properties. 9. Appraisers are more likely to appraise Staged homes at full value. to specifically prepare your home for sale. Click Here to take a look at our Services to see how we can help.